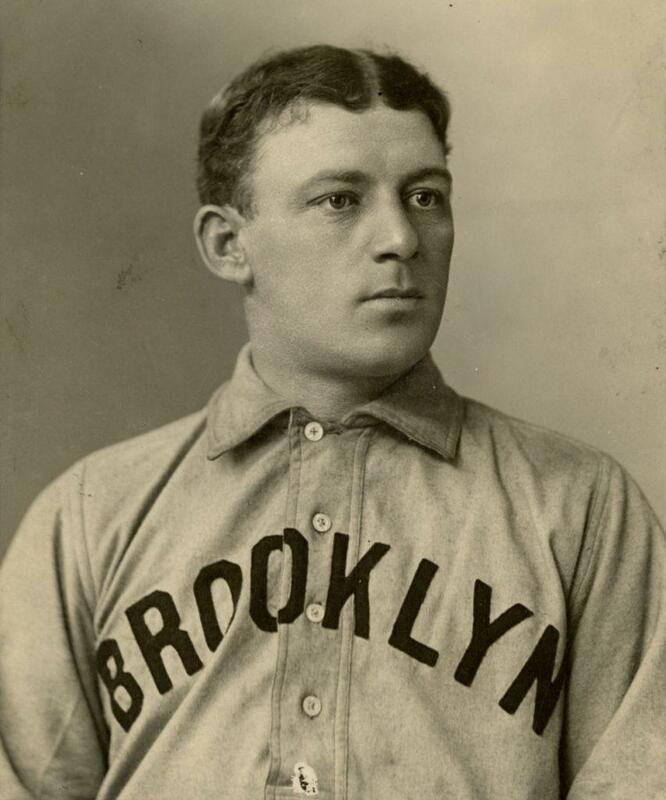 The Society for American Baseball Research (SABR) selected Bill Dahlen as their most Overlooked 19th Century Baseball Legend for 2012. 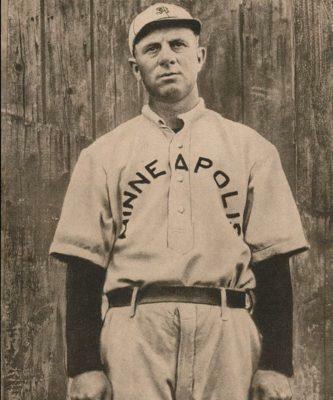 In an interesting footnote to Dahlen’s association to baseball in its infancy, Willie Keeler was the best man at the ceremony for Dahlen’s second marriage on December 22, 1903. Keeler and Dahlen were teammates for three seasons from 1899-1902. With the scarcity of Dahlen’s signature, it’s difficult to imagine a better more desirable format of the shortstop’s autograph. 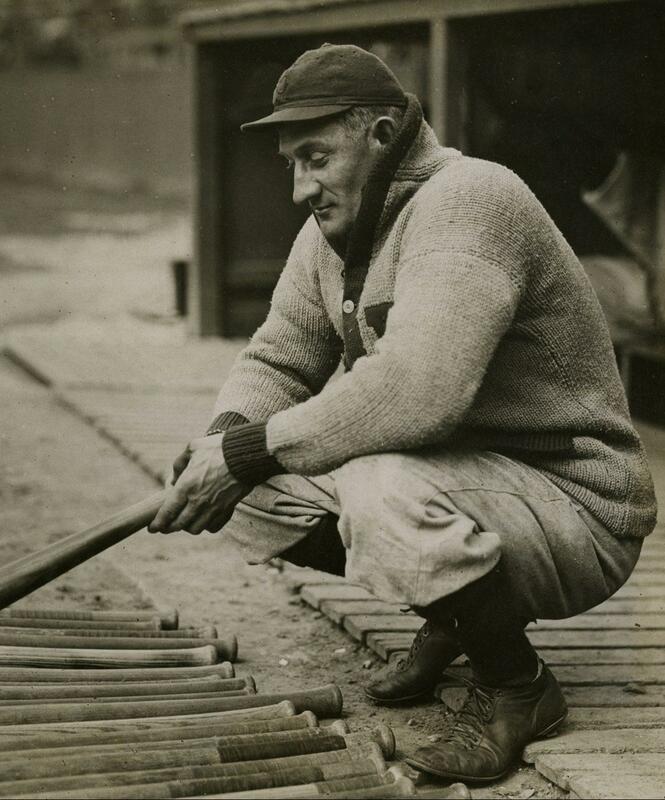 When asked to identify the the greatest ball player of all time Bill Dahlen chose Honus Wagner and Ty Cobb as shown in the previous image. In the collection and depicted above is Wagner’s signature. Imagine having a lifetime pass to any game in the National League. That’s what NL President Ford Frick bestowed upon Honus Wagner 18 years after the Flying Dutchman retired. Overjoyed by the gesture Wagner, one of the first five Hall of Fame inductees, sent a handwritten thank-you letter to Frick 12 days later on April 25, 1935. Wagner dropped the letter at the post office on a Thursday afternoon after the Pirate team for which he served as hitting instructor fell in 6-0 loss at Cincinnati. Future Hall of Famer Waite Hoyt took the loss for Pittsburgh, but Wagner’s thoughts were full of gratitude to Frick for his kind gesture. 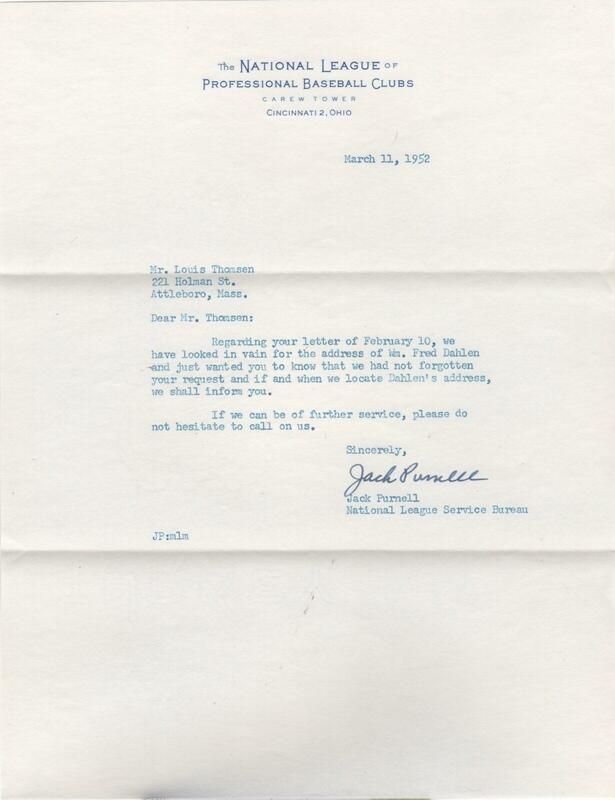 Notice Wagner’s flowing handwriting and gracious tone in the letter which is signed “J Honus Wagner Pirate Coach” at the bottom of the hotel letterhead. 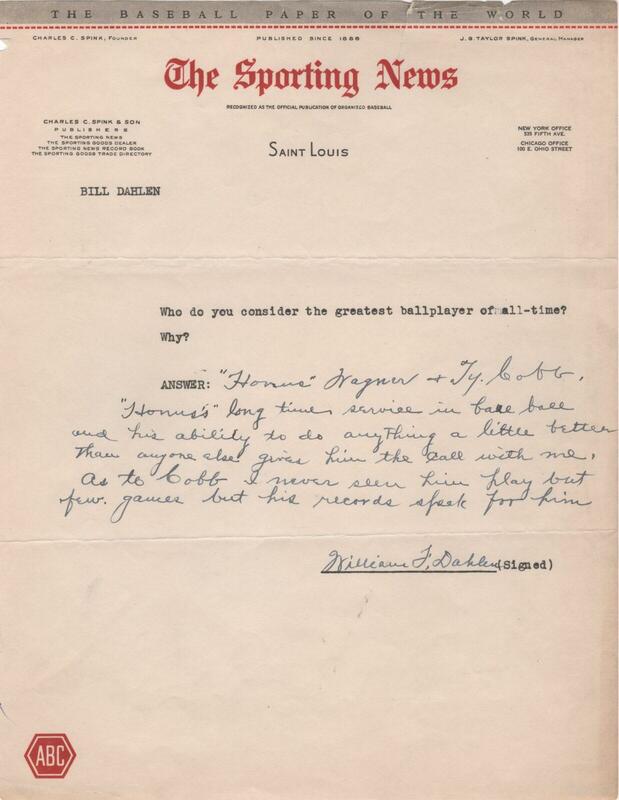 The Sporting News sent questionnaires to former big league stars asking them to identify the greatest ball players ever. 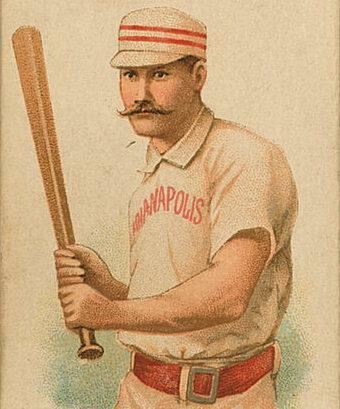 When 19th century star Bill Dahlen was asked, he chose Honus Wagner and Ty Cobb. Shown above is the signature of the Tigers great. In the mid 1980’s Cobb’s granddaughter flooded the autograph collectible market with the Georgia Peach’s personal checks. Until the end of the decade, these beauties could be had for under $50. This example is made out to a book store and is dated September 5, 1945. While Cobb was shopping for reading material, his Tigers were in New York dropping a 5-1 contest to the Yankees. The 12-time batting champion retired with 4,189 hits, a mark eclipsed only by Pete Rose. 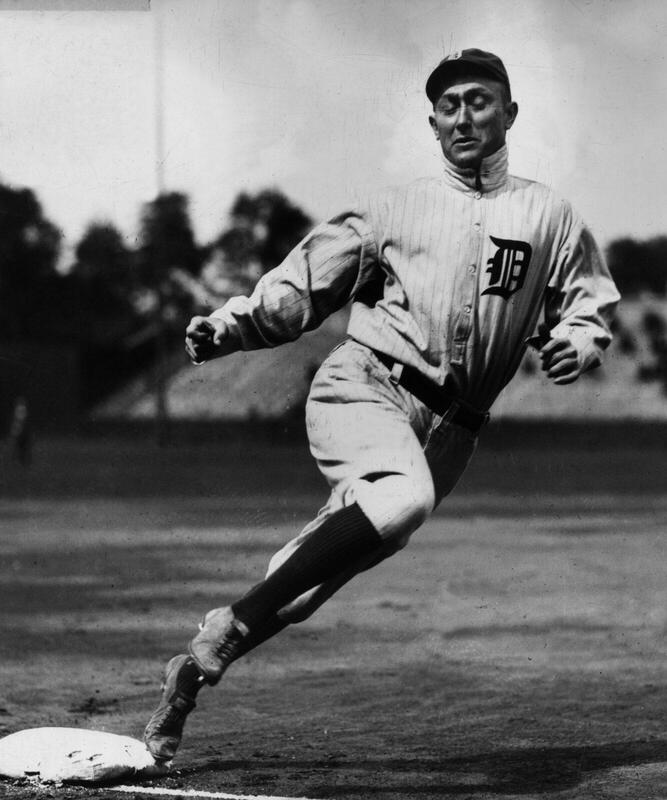 Tyrus Raymond Cobb received the most votes in the initial ballot for Baseball’s Hall of Fame. 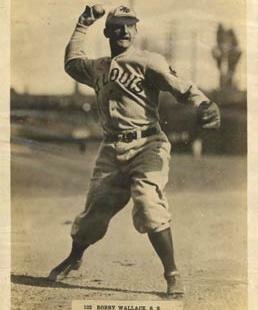 He was inducted in 1936. 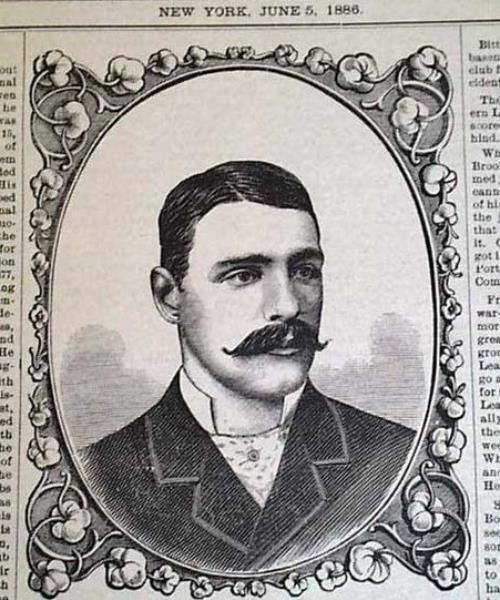 A star of 19th-century baseball, Bill Dahlen ranks among the greatest shortstops the game has ever known. Of the 25 Hall of Fame players from the position, only eight rank higher the Dahlen in Wins Above Replacement (WAR). Born five years after the conclusion of the US Civil War, Dahlen’s signature remains absent from even the most advanced collections. 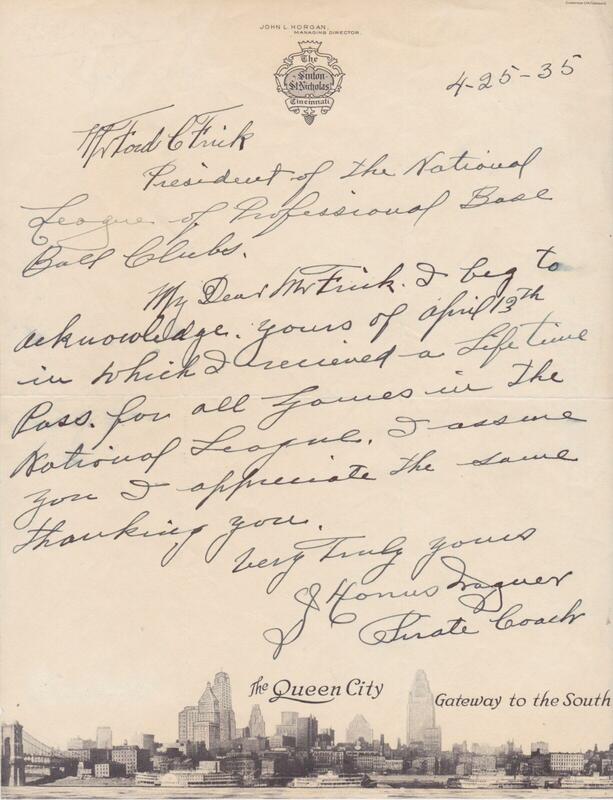 Shown here is a letter from the National League Service Bureau responding to an autograph collector’s request for Dahlen’s address. Jack Purnell who has signed the letter as a representative of the NL responds that they’ve “looked in vain” for a way to contact Dahlen. It would make sense that Dahlen would be hard to find — the letter is dated 15 months after his death.